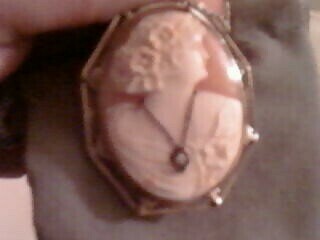 I have this cameo and I know nothing about it other than it belonged to a woman in her 80's who has passed away. Can you give me any info on its value/type/origin etc? It is a brooch but came with a chain that matches the chain worn by the woman on the cameo. It has a VIII engraved or scratched on the back of the orange part of the cameo. I can't seem to find any info on if this is a signature or a number for the piece. It can't be seen in the picture, but there is a beautiful fine silver filligree type of curvy design between the oval and the silver outer shape...The gem appears to be a diamond.